"The small hamlet of Clara, which is three miles from Rathdrum, is romantically situated in the bottom of the Vale of Clara, a little to the right of the road leading to the Seven Churches. It occupies nearly the centre of the Vale, which runs from Rathdrum to Laragh, an extent of six miles, and through which the Avonmore sweetly flows. The Vale is bounded on the east by the copse-clad heights which stretch from the valley under the town of Rathdrum and then to Laragh by the hills which connect with Trooperstown Mountain; and on the west, by the varied declivities of the Mountains Kirkee and Carrigliveen. 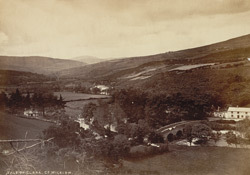 The Vale of Clara, though presenting none of the greater and more impressive features of nature as at Glenmalure, is in many places romantic and beautiful, and unites a high degree of sylvan richness with a diversity of natural objects; and the views of the Avonmore, as seen from several parts of the road and from many of the adjacent heights, as it sweeps down the Vale under its oak-covered banks, awakes in the mind the softest and most delightful sensations. From Copse House, a seat of the Earl Fitzwilliam, situated in a wood, the road, maintaining a considerable elevation, proceeds along the right bank of the Avonmore, which flows through the Vale of Clara, and commands beautiful reaches of the river and the opposite copse-wood. This copse-wood is the largest in Wicklow; a great portion of it forms part of the large estate of Earl Fitzwilliam, and stretches from the vicinity of Rathdrum to the base of Kingstown hill, a distance of three and a half miles, and is, on an average, about a mile in breadth. From its extent it is a striking feature in the district, and clothes the left bank of the Vale of Clara for two miles."